Alan Kitching is a practitioner of letterpress typographic design and printmaking. This link explains what is a riso print. It is a printer where you have to print by layers. For that it is important to structure the file accordingly so that it comes of on the colours that you want to create contrast. 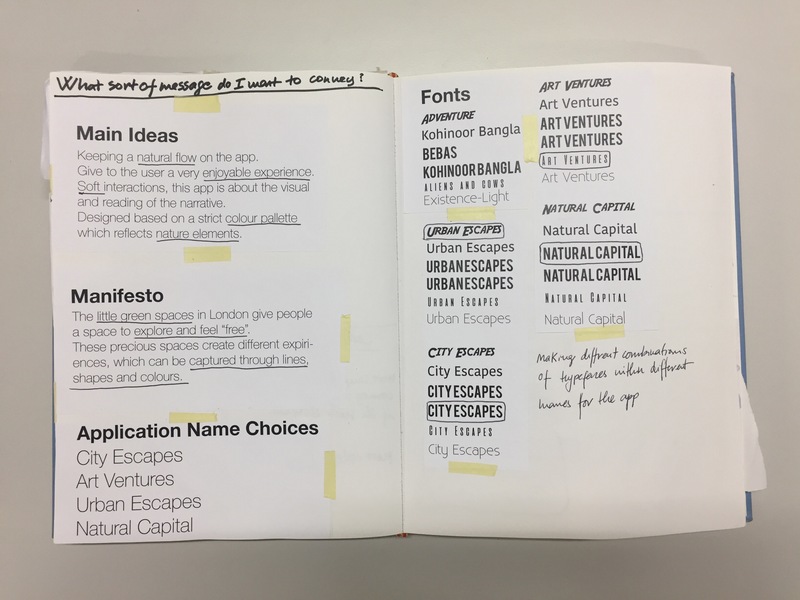 For the exercise we based our print a previous typography workshop but this time using a poem that we have done weeks ago that was based on what we thought about the city of London. 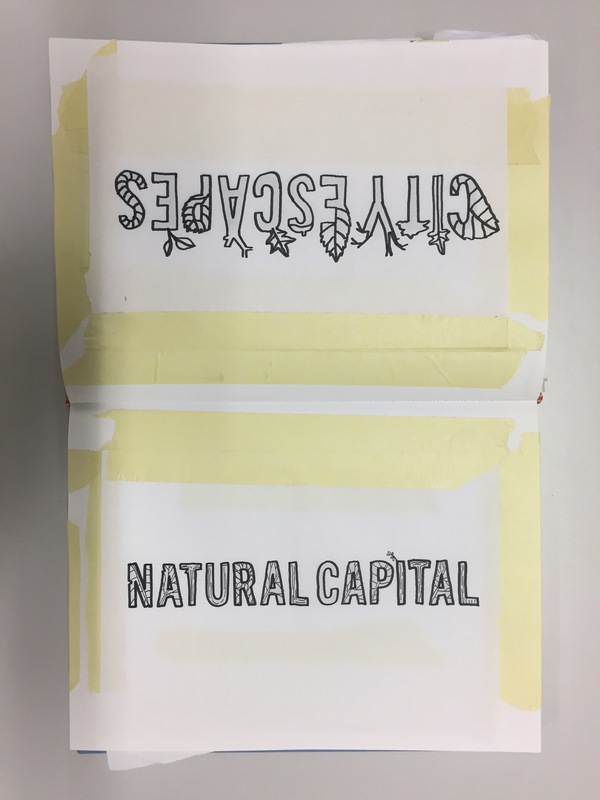 These two files will then be added on to the riso print each one with it’s own role of ink. Beacause I was one of the last to do the print I ended up with a nice print.This is it! 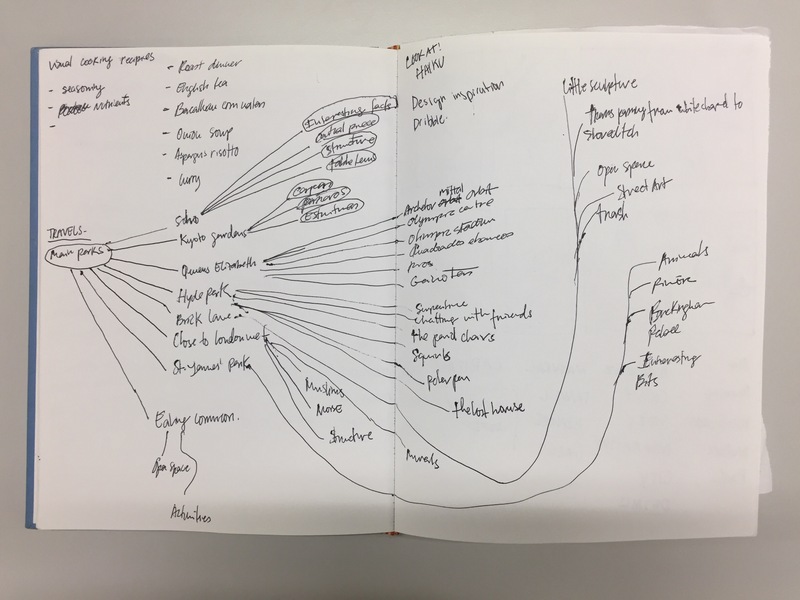 On the last Tuesday 15 November, We had to explore different interfaces and understand the process of the user while using them. Interface: a point where two systems, subjects, organizations, etc. meet and interact. As a group we looked at defined interfaces of the brief, such as, the lift, a vending machine or the printer. Functional, or not functional, simple or complex, digital or physical, the interfaces can proviede data to understand the purpose of such interfaces. After going through a mandatory list we had to think about other interfaces to document for further discussion on the afternoon. These were all the interfaces that we have documented. I felt that the exercise can be useful once you need to understand how you want to build up your own interface. It means that all the evidence and tools are close to us and we just need to carefully observe and break down the information provided. The discussion was really interesting and overall all groups had a really interesting approach of the brief. Down below I represented the process that i am following to develop my app. 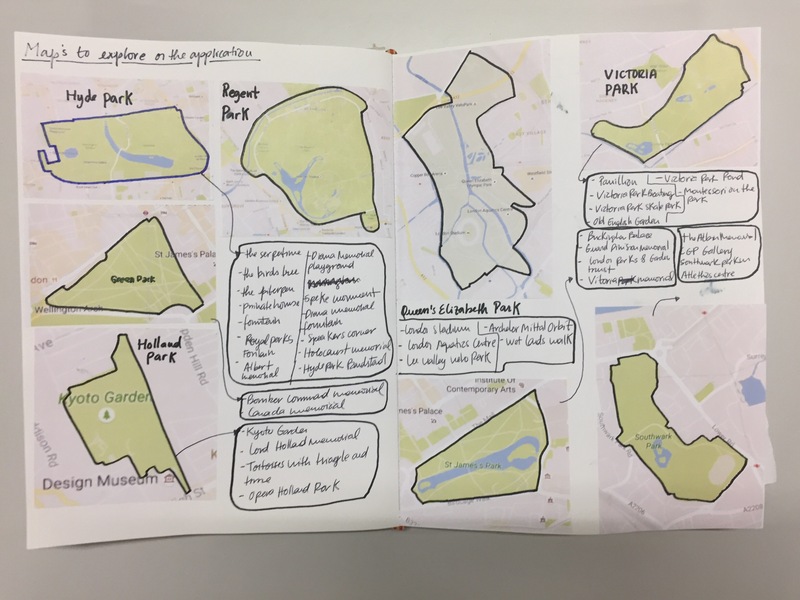 My idea of the app is nature navigator where people can read now more about the park in the city and follow a journey represented through illustrations. 4th step-Mapping- how can I show my journey. After this I am building a board with the screen layout of my print explain as well the interactions within the app. I need to do the journeys make the drawings paint them and put all together. Fears that the UK would “sleep-walk into a surveillance society” have become a reality, the government’s information commissioner has said. Richard Thomas, who said he raised concerns two years ago, spoke after research found people’s actions were increasingly being monitored. Researchers highlight “dataveillance”, the use of credit card, mobile phone and loyalty card information, and CCTV. Monitoring of work rates, travel and telecommunications is also rising. There are up to 4.2m CCTV cameras in Britain – about one for every 14 people. Produced by a group of academics called the Surveillance Studies Network, the report was presented to the 28th International Data Protection and Privacy Commissioners’ Conference in London, hosted by the Information Commissioner’s Office. The report’s co-writer Dr David Murakami-Wood told BBC News that, compared to other industrialised Western states, the UK was “the most surveilled country”. “We have more CCTV cameras and we have looser laws on privacy and data protection,” he said. The report coincides with the publication by the human rights group Privacy International of figures that suggest Britain is the worst Western democracy at protecting individual privacy. The two worst countries in the 36-nation survey are Malaysia and China, and Britain is one of the bottom five with “endemic surveillance”. Mr Thomas called for a debate about the risks if information gathered is wrong or falls into the wrong hands. “We’ve got to say where do we want the lines to be drawn? How much do we want to have surveillance changing the nature of society in a democratic nation?” he told the BBC. The Smell of Data fragrance bottle releases a metallic scent when a user encounters an unprotected website or Wi-Fi network on their devices. Leanne Wijnsma and filmmaker Froukje Tan created the product in response to concerns about data security on the internet. The project aims to educate users about what is going on with their data. Wijnsma and Tan evolved the concept by researching the human response to gas leaks. The designers were particularly inspired by a 1937 explosion in the US state of Texas that was caused by an unnoticed gas leak. The incident prompted the government to artificially add scent to odourless gases, making them more readily detectable. Wijnsma and Tan received an e-culture grant from the Dutch Cultural Media Fund to develop Smell of Data in 2014 and launched it in September 2016 at the Science Museum in London. Stockholm Design Week: Swedish designers Per Emanuelsson and Bastian Bischoff exhibited the Surveillance Light lamp at Stockholm Furniture Fair earlier this month. The floor-light is modelled on surveillance cameras. “Recent discussion about surveillance in society inspired the creation of a piece of furniture with an Orwellian ‘1984’ feel to it,” the designers say. The piece was exhibited as part of an exhibition of work in progress from masters design students from the School of Design and Crafts at the University of Gothenburgin Sweden. See the exhibition catalogue here. 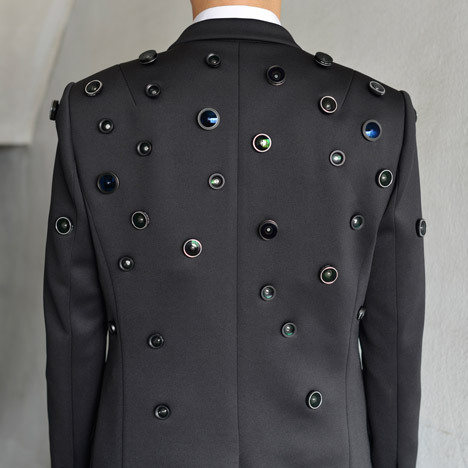 This jacket by Seoul design studio Shinseungback Kimyonghun is covered with camera lenses that can record assailants and broadcast the images on the internet (+ movie). 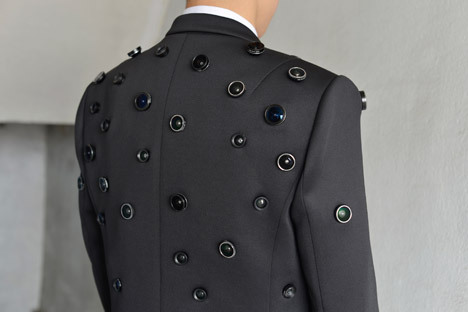 Shinseungback Kimyonghun placed the different-sized lenses all over the tailored Aposematic Jacket to serve as a warning to potential attackers that their actions might be recorded. The wearer pushes a hidden button to record images of their environment, which are automatically published on a designated web page via a wireless network. 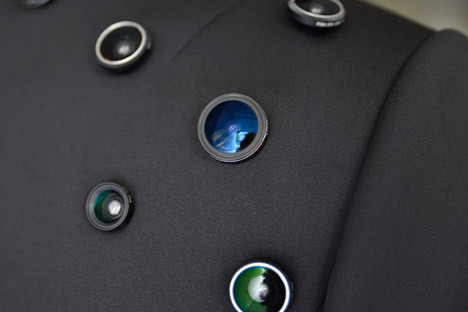 Although the lenses are positioned all over the garment, only four are actually hooked up to camera modules. Located on each of the four sides, the cameras create a 360-degree panoramic snapshot of the surroundings. Instead of surveillance, which implies a group watching an individual, the designers describe the concept as souveillance – where an individual is watching others. “The jacket is a kind of sousveillance camera that protects its wearer like surveillance cameras are used to protect goods in shops,” said Kim. The Aposematic Jacket is named after the colouration displayed by organisms to alert predators that eating them will bring consequences. For example, poisonous frogs often have brightly coloured skin. 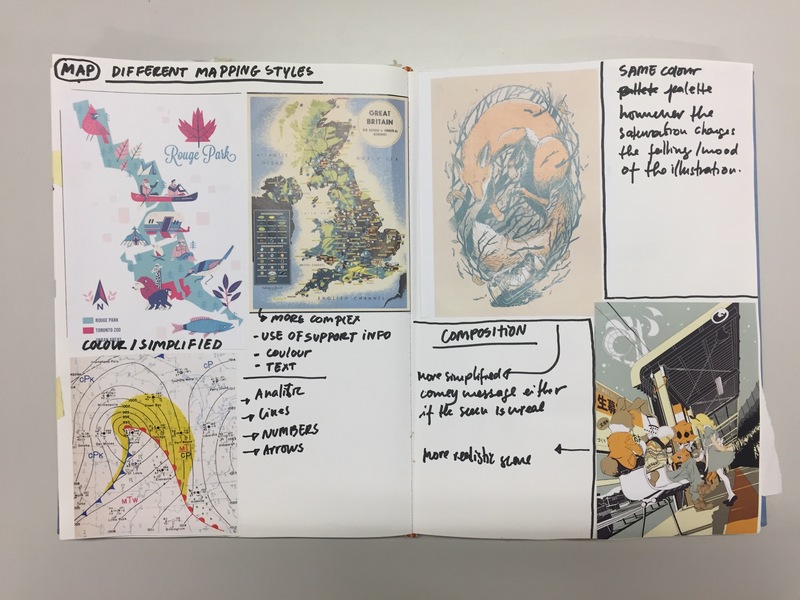 The project is a response to the increasing amount of cameras in our lives, including CCTV around buildings and public spaces, Google Street View’s incessant capturing of the environment and drones that can photograph scenes from the skies. This range of anti-drone clothing was created by New York designer Adam Harvey to hide the wearer from heat detection technologies. Drones, also known as unmanned aerial vehicles, can be equipped with thermal imaging cameras and deployed by the military or police to locate individuals using heat signatures. The metallic fibres in Harvey‘s lightweight garments reflect heat, masking the wearer’s thermal signature and rendering them undetectable. Three pieces make up the collection including a zip up cape with a peaked hat, which almost completely cloaks the body, and a scarf that can be draped where needed. “Conceptually, these garments align themselves with the rationale behind the traditional hijab and burqa: to act as ‘the veil which separates man or the world from God,’ replacing God with drone,” says Harvey. The cropped hoodie is designed to cover the head and shoulders, areas that would be exposed to drones overhead. Pieces were designed in collaboration with New York fashion designer Johanna Bloomfield. All images are copyright Adam Harvery/ahprojects.com. 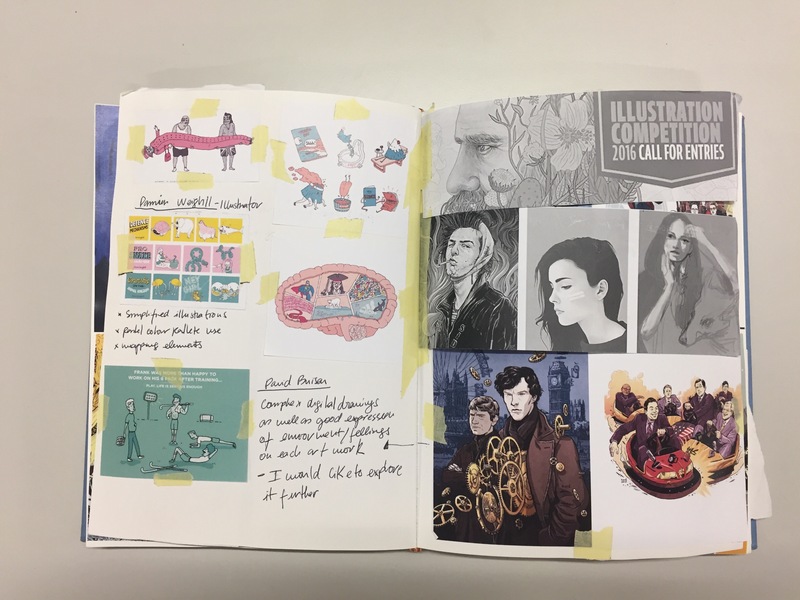 In his lastest opinion column, Sam Jacob discusses how US surveillance programme PRISM and the impact of digital culture are influencing design thinking. Our other stories about design based on surveillance include eavesdropping devices that were presented at an exhibition in Israel and lights modelled on security cameras. For my new project I am collecting the meaning of colors so that can use them for my illustrations in a much clever way. 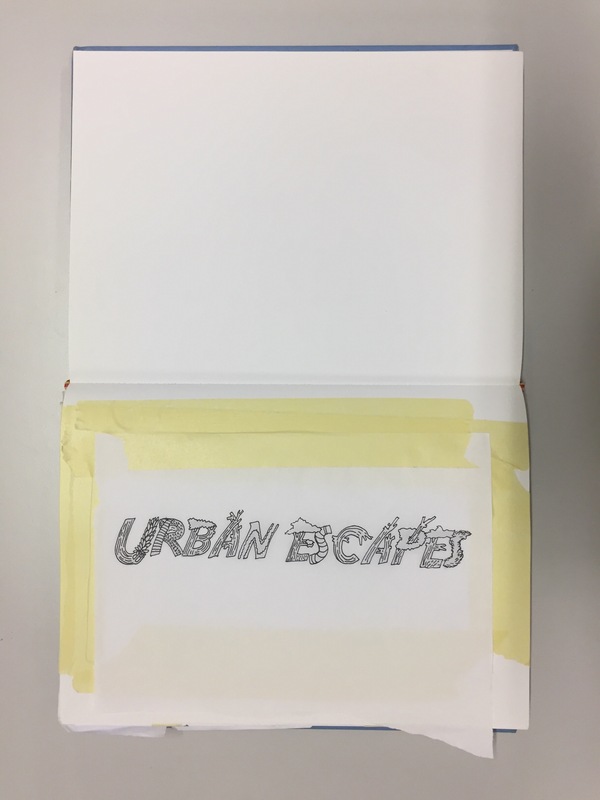 By mixing them I can create meaning and by the use of them in my app I can give to the user a much more complete experience as well as creating a tool which will make me easy to convey my message. Warm colors- Thy can be associated with Fire, Sun, Light, Leaves falling. They can transmit, energy, love,positivity, enthusiasm and happiness. Red is a very hot color. It’s associated with fire, violence, and warfare. It’s also associated with love and passion.Physical effect on people, raising blood pressure and respiration rates. Orange is a very vibrant and energetic color.It can be associated with the earth and with autumn. Because of its association with the changing seasons, orange can represent change and movement in general. Brightest and most energizing of the warm colors associated with deceit and cowardice.Yellow is also associated with hope and danger (but not as red). Bright yellow can lend a sense of happiness and cheerfulness. Softer yellows are commonly used as a gender-neutral color.Dark yellows can sometimes look antique and be used in designs where a sense of permanence is desired. Cool colors are more subdued than warm colors. They are the colors of night, of water, of nature, and are usually calming, relaxing, and somewhat reserved.Blue is the only primary color within the cool spectrum, which means the other colors are created by combining blue with a warm color. Greens take on some of the attributes of yellow. It can represent new beginnings and growth. It also signifies renewal and abundance. Alternatively, green can also represent envy or jealousy, and a lack of experience. Calming attributes that blue some of the energy of yellow.It balances and harmonizing effect appropriate for designs related to wealth, stability, renewal, and nature. Brighter greens are more energizing and vibrant, olive greens representative of the natural world. Dark greens are the most stable . Blue is often associated with sadness in the English language. Blue is also used extensively to represent calmness and responsibility. Light blues can be refreshing and friendly. Dark blues are more strong and reliable. Blue is also associated with peace.The exact shade of blue you select will have a huge impact on how your designs are perceived. Light blues are often relaxed and calming. Bright blues can be energizing and refreshing. Dark blues are excellent for corporate sites or designs where strength and reliability are important. Purple sometimes takes on some of the attributes of red. Purple was long associated with royalty.It’s associated with creativity and imagination, too.Dark purples can give a sense wealth and luxury. Light purples are softer and are associated with spring and romance. Black is the strongest of the neutral colors. On the positive side, it’s commonly associated with power, elegance, and formality. On the negative side, it can be associated with evil, death, and mystery.It’s also associated with rebellion. Commonly used in edgier designs, as well as in very elegant designs. It can be either conservative or modern, traditional or unconventional, depending on the colors it’s combined with. In design, black is commonly used for typography and other functional parts, because of it’s neutrality. Black can make it easier to convey a sense of sophistication and mystery in a design. White is often associated with purity, cleanliness, and virtue. It’s also associated with the health care industry, especially with doctors, nurses and dentists. White is associated with goodness, and angels are often depicted in white.In design, white is generally considered a neutral backdrop that lets other colors in a design have a larger voice. It can help to convey cleanliness and simplicity, though, and is popular in minimalist designs. Gray is a neutral color, generally considered on the cool end of the color spectrum. It can sometimes be considered moody or depressing. Light grays can be used in place of white in some designs, and dark grays can be used in place of black. Gray is generally conservative and formal, but can also be modern. It is sometimes considered a color of mourning. It’s commonly used in corporate designs, where formality and professionalism are key. It can be a very sophisticated color. Brown is associated with the earth, wood, and stone. It’s a completely natural color and a warm neutral. Brown can be associated with dependability and reliability, with steadfastness, and with earthiness. It can also be considered dull. It helps bring a feeling of warmth and wholesomeness to designs. Beige is somewhat unique in the color spectrum, as it can take on cool or warm tones depending on the colors surrounding it. It’s a conservative color in most instances, and is usually reserved for backgrounds. It can also symbolize piety. Beige in design is generally used in backgrounds, and is commonly seen in backgrounds with a paper texture. Ivory and cream are sophisticated colors, with some of the warmth of brown and a lot of the coolness of white. They’re generally quiet, and can often evoke a sense of history. Ivory is a calm color, with some of the pureness associated with white, though it’s a bit warmer. In design, ivory can lend a sense of elegance and calm to a site. 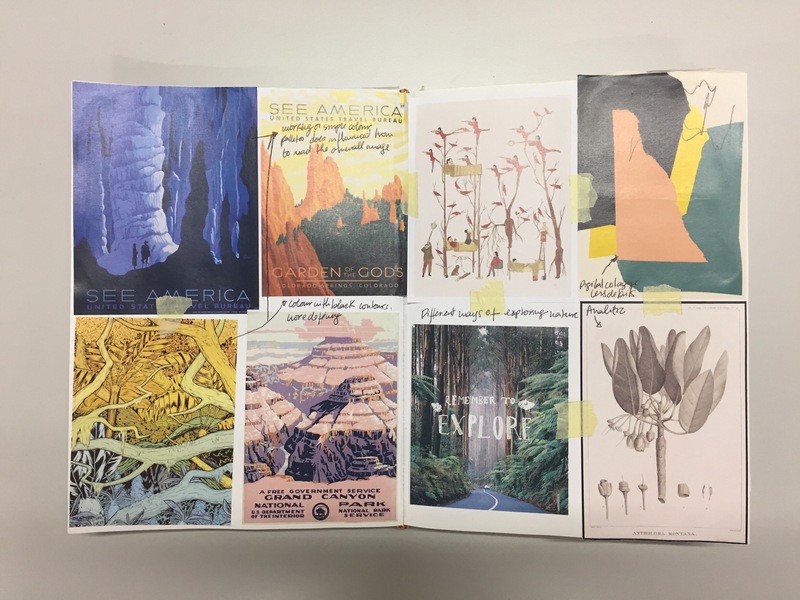 Last Friday we were challenge to develop 50 posters.